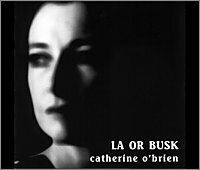 Due to popular demand singer/lyricist Catherine O'Brien released her first album, LA OR BUSK and is a combination of jazz, rhythm and blues, and Latin. LA or BUSK – the title came about because Catherine O’Brien was invited by Bob Haggart (composer of the music of “I’m Free” and “My Inspiration”) to attend the annual LA Classic Jazz Festival in the USA. Catherine had the title LA or Busk on her guitar case while busking to help raise the money for the trip, which she made in 1996. "..I enjoyed hearing you sing your lyrics of "I'm Free" and "My Inspiration"
(long distance).." Bob Haggart 6th August 1994. For more about the story behind LA OR BUSK click here. A tribute to Billie Holiday.